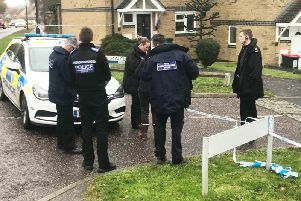 A boy drug dealer accused of murdering Crawley man Arnold Potter told police he was attacked and feared for his life. Arnold Potter, 24, died from two deep chest wounds he suffered near Watson Close on November 15 last year. The 17-year-old boy – who cannot be named for legal reasons – has been standing trial charged with murder and possessing a bladed article. He denies both charges. Prosecutor Rowan Jenkins told Hove Crown Court last week that the incident was a ‘deliberate attack’ by the defendant with a ‘lethal weapon’. Click here to read more from the prosecution's opening. Mr Potter was praised as a 'loving, caring and kind-hearted man' by his family after his death. Today the jury were played a recording of the defendant’s police interview, in which describes the encounter with Mr Potter. Appearing very distressed and crying in interview, the boy tells police: “I decided to walk down to the local shop to get a drink. I saw Arnold come out of the alleyway. “Arnold is someone I know who had a violent record and is a lot bigger than me. The boy said that Mr Potter spun him round and put the knife against his back, ordering him to take him to his home so that he could ‘take everything’, the court heard. He told police that his phone had rung and he had reached into his bag to answer it when Mr Potter told him to leave it. “I started to bring my hand out [when I] felt the knife. I have gone to answer the phone and realised it was there. The boy told officers that he did not know his knife was in the bag until that moment, the court heard. He continued: “I took a big step forward to get away from his knife in my back and I swung mine at him. Mr Potter then ran off, the boy said, and he gave chase until he stopped near Watson Close. At this point the defendant said he ‘stopped running, turned round and went home’, but quickly left again. “I was very scared as I had seen so much blood on Arnold. The boy handed himself in to police the following day and was taken to Brighton custody centre.